Digital printing provides you the option of printing a small quantity of books within a short period of time. In digital print – you can print perfect bound books in quantities of 1-1,000 ...and have the books ship expediently. The quality of our digital printing is outstanding. The colors are crisp and the black text is comparable to our offset standards. We have color calibrated our digital to our offset printers, which means that you can expect the same great cover on a few books – that you received on 2,000 books printed via Offset. It is so easy to insert color pages into a digital book. Just set up your text file with the color pages in place. Color pages can be sporadic or an insert group of pages. There is no need to send separate files for color and black ….give us just one file with all of the pages. Digital printing quotes are designed to provide you with good supply of books now! We print and ship books within 4 days of receipt of your good files. When producing your books digitally, it’s vital to have properly prepared PDF files and select inventoried materials to help keep costs down and improve speed times. Thomson-Shore offers a publishing platform that helps you meet the ebbs and flows of your title’s stringent demand. We use the same electronic files for digital and offset print runs, making production less complicated and more efficient. As an added benefit, we also offer many of the same materials used in our longer offset runs. 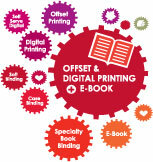 We even offer digital case binding! Contact us today to get started. We’ll listen to you, walk you through all of the options, and provide a plan specific to your needs.